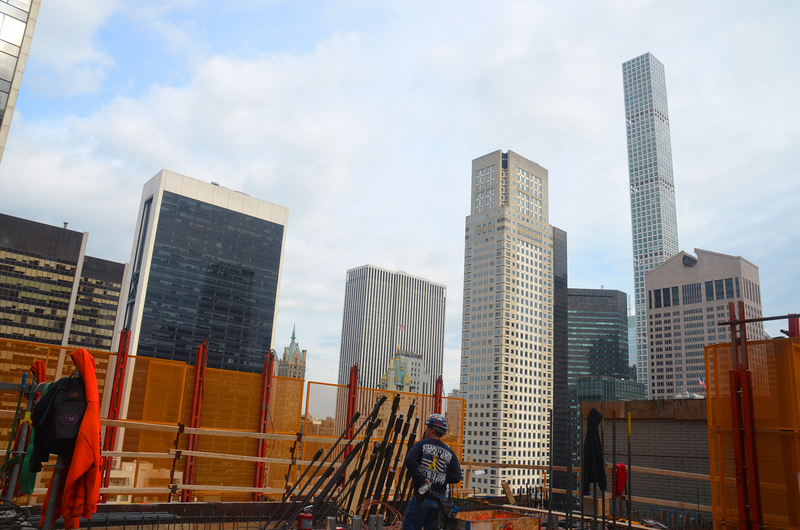 One of New York City’s newest crop of supertalls will soon sprout above its neighbors. 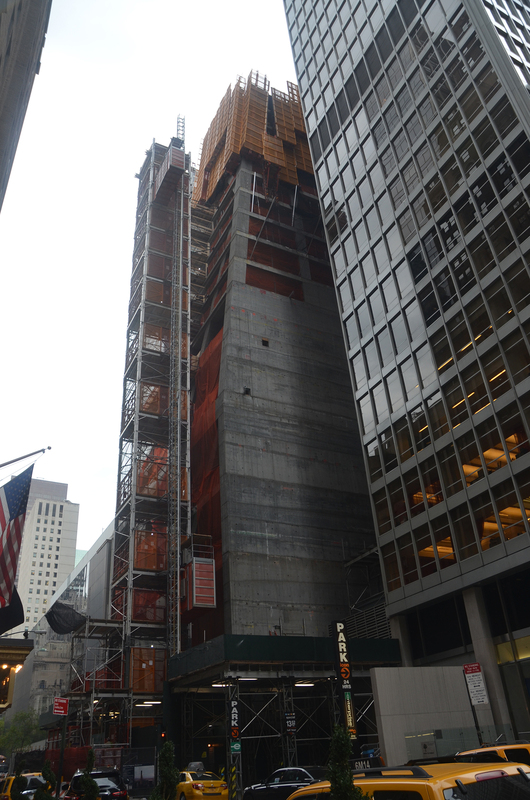 YIMBY recently stopped by 53W53, where curtain wall installation recently began. 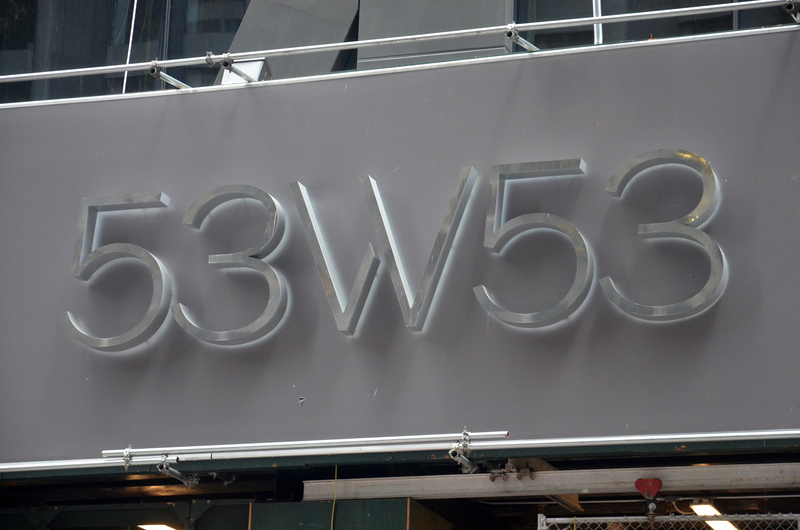 53 West 53rd Street is a through-block site between Fifth and Sixth avenues, right next to the Museum of Modern Art. 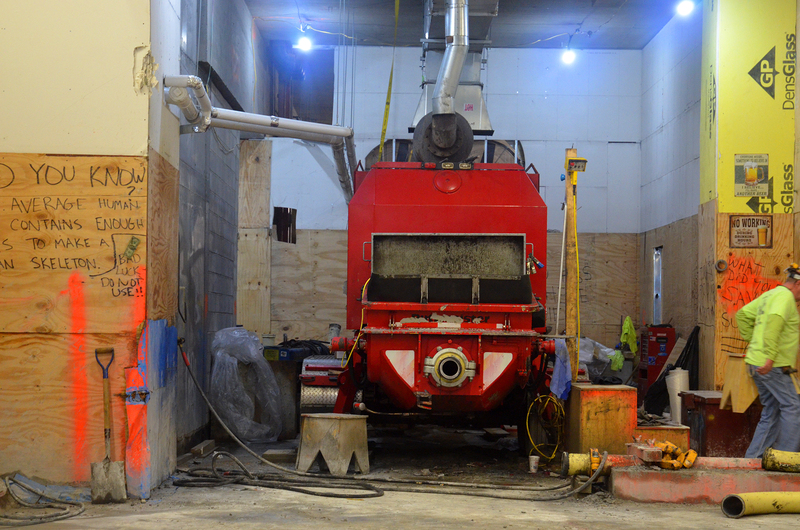 In fact, the museum, at work on an expansion project, will have space in the new residential building. 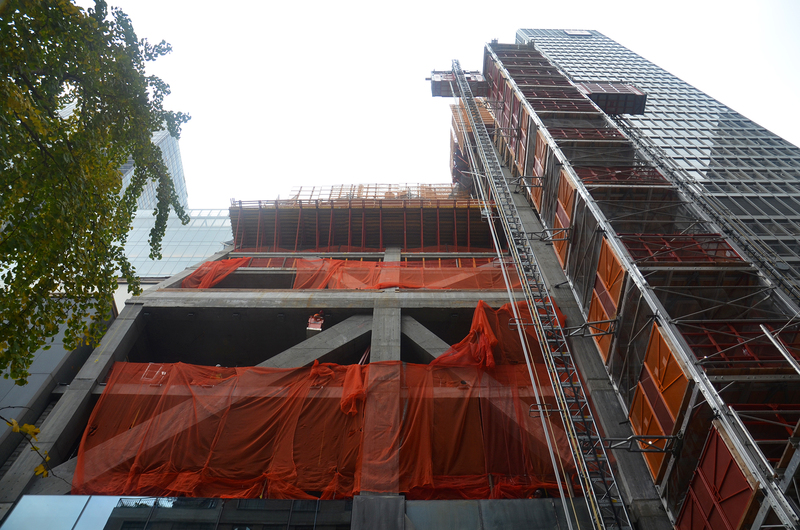 Eventually, 53W53, designed by Jean Nouvel, will rise a marketed 82 stories to 1,050 feet. 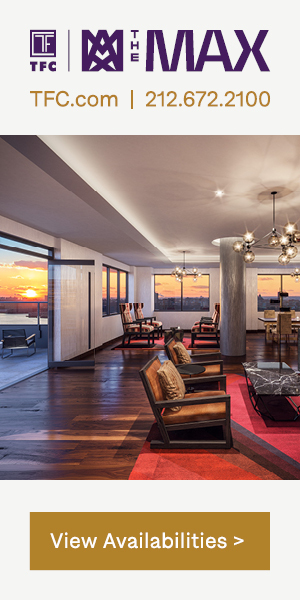 Inside will be 145 condominiums designed by Thierry Despont. 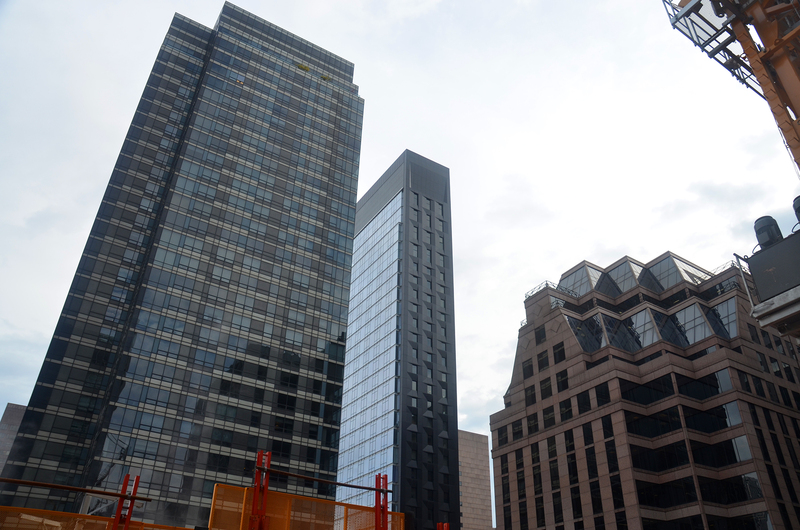 Hines and the Pontiac Land Group, along with Goldman Sachs, are the developers. 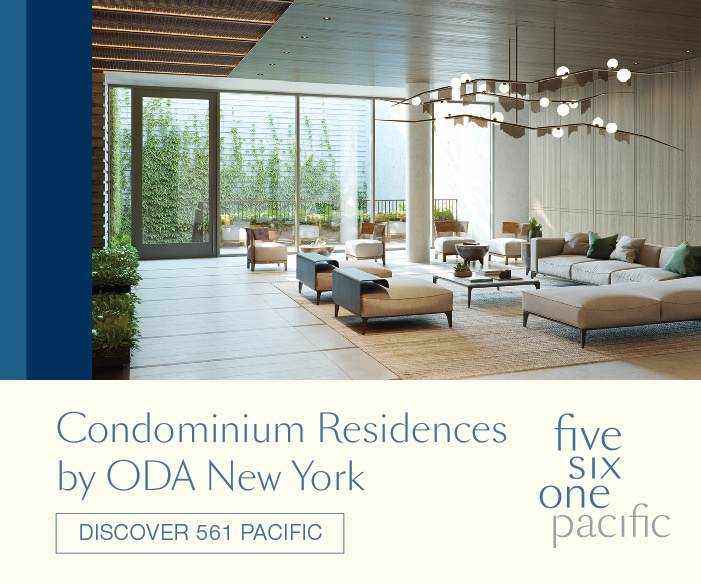 David Penick, managing director at Hines, and Tim Flynn, vice president of design and construction at Hines, served as YIMBY’s guides during this visit to 53W53. 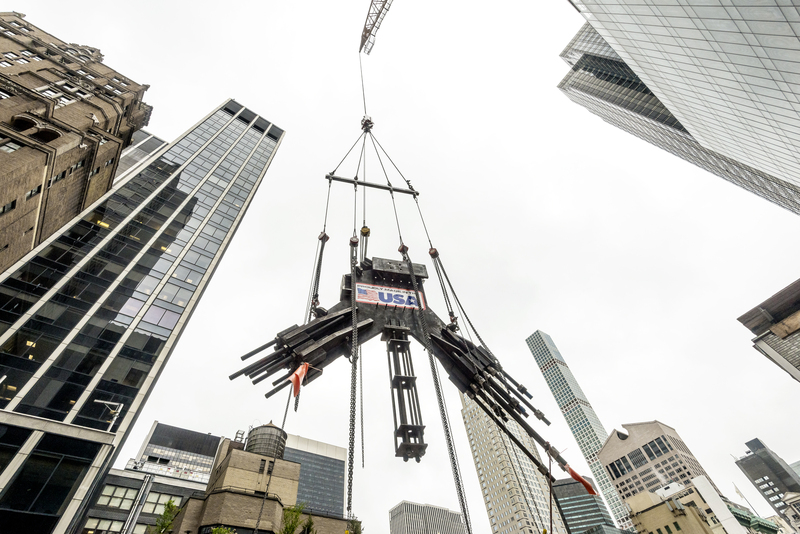 Currently, it stands about 20 stories off the ground, with nearly 30-foot-tall, triple-glazed glass panels, manufactured in Germany and assembled in Texas, in place on the floors that will house MoMA’s expansion area. 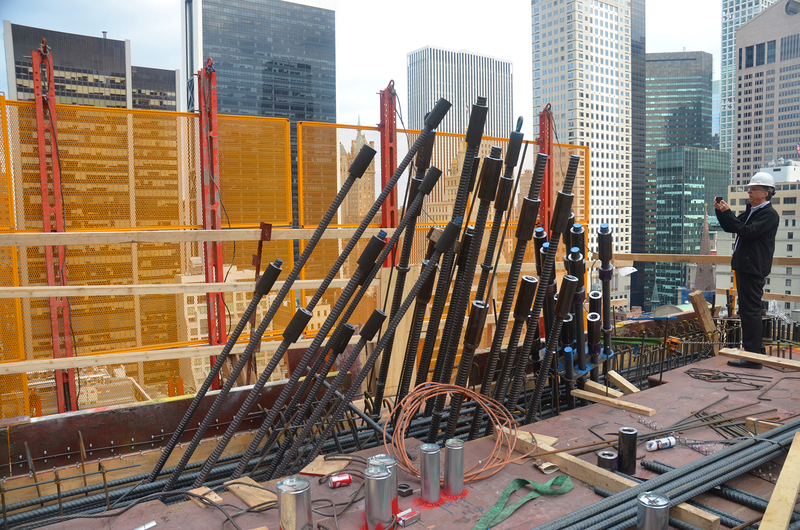 In the end, there will be 5,747 glass panels on the structure. Also clearly on display is the diagrid. 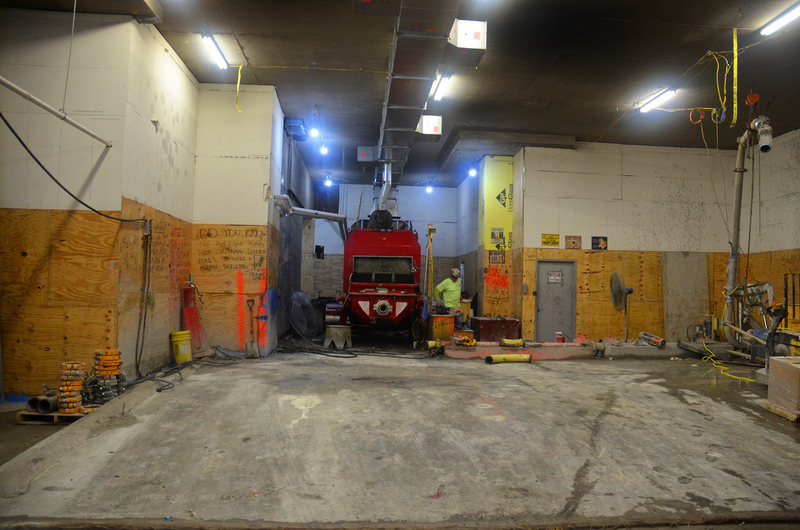 The building is being constructed using poured concrete, delivered to a pump on the ground floor and from there, pumped to the top. 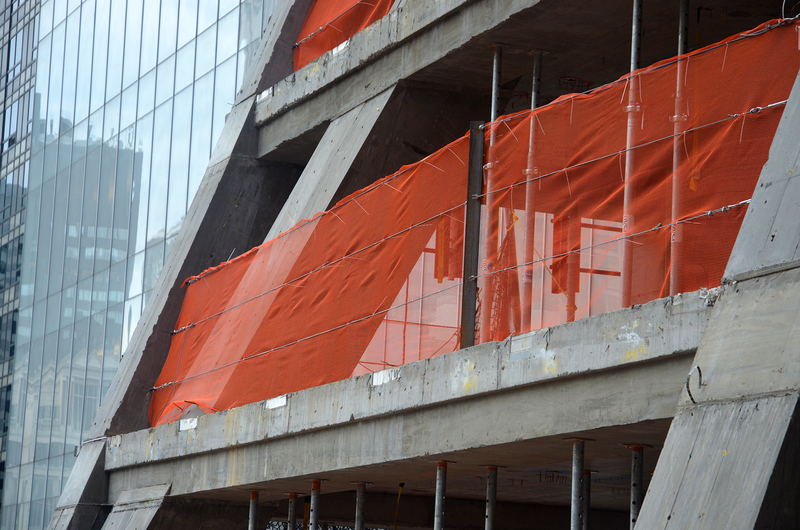 This is the first building using a diagrid to this scale in poured concrete. 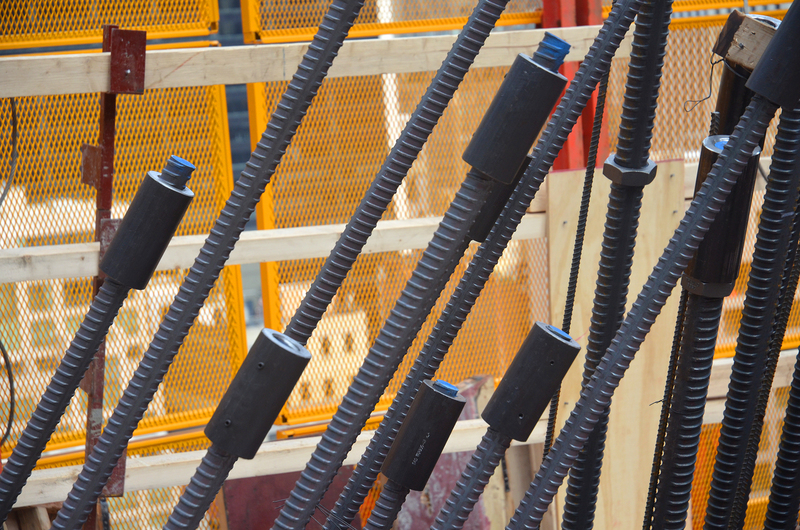 Of course, there are also steel cables in the diagrid, but so many that they have to be tied together at massive metal nodes. 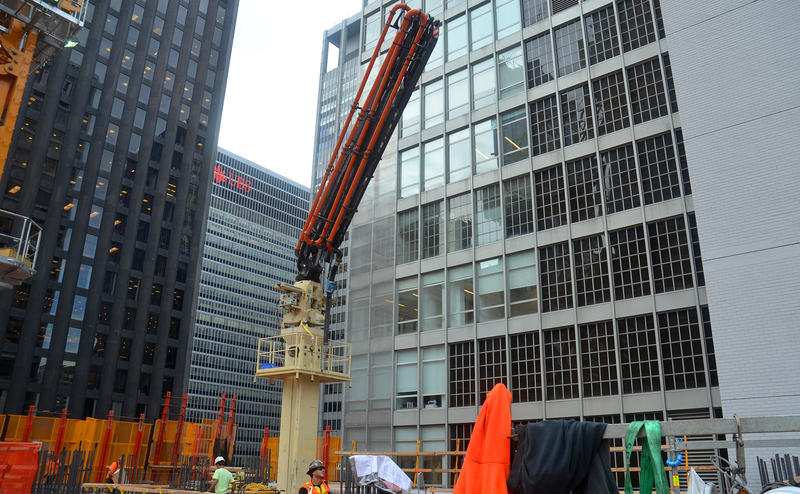 One already installed on the sixth floor weighs 12,4000 pounds. The one that will join these cables will weigh 5,200 pounds. The building will end up with 31 nodes. At the top, the view is starting to get impressive. 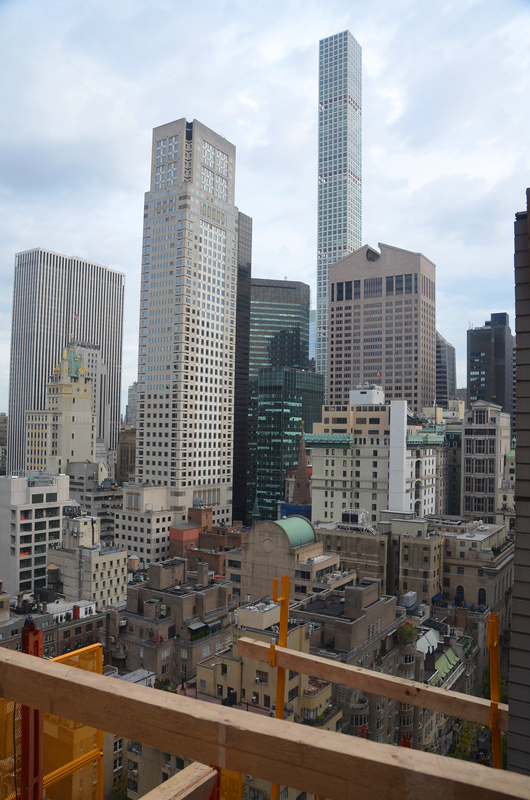 Clearly visible to north-northeast are 9 West 57th Street, the Sherry-Netherland hotel, the GM Building, 432 Park Avenue, and the former Sony Tower. 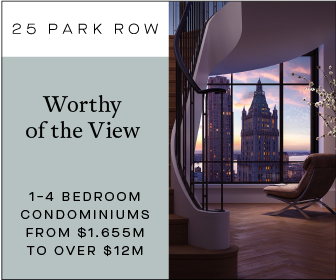 That view is unlikely to be obstructed in the foreseeable future. 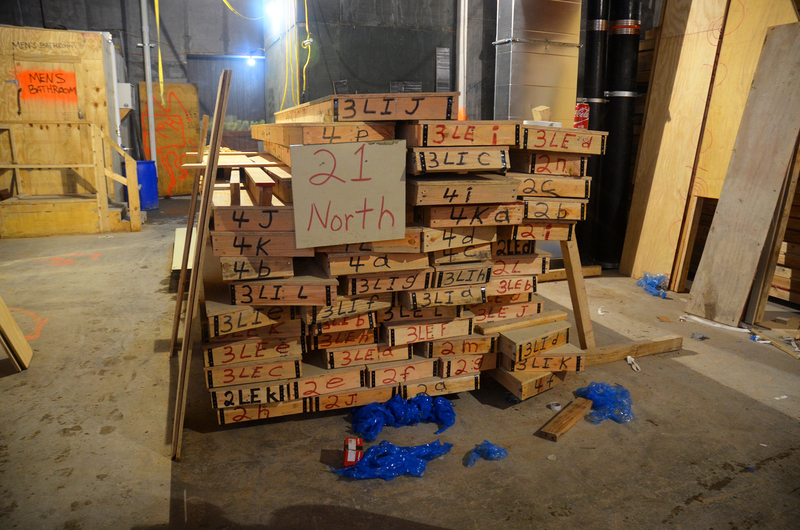 Penick and Flynn also pointed out these yellow temporary cages that are constructed at the top of the building. 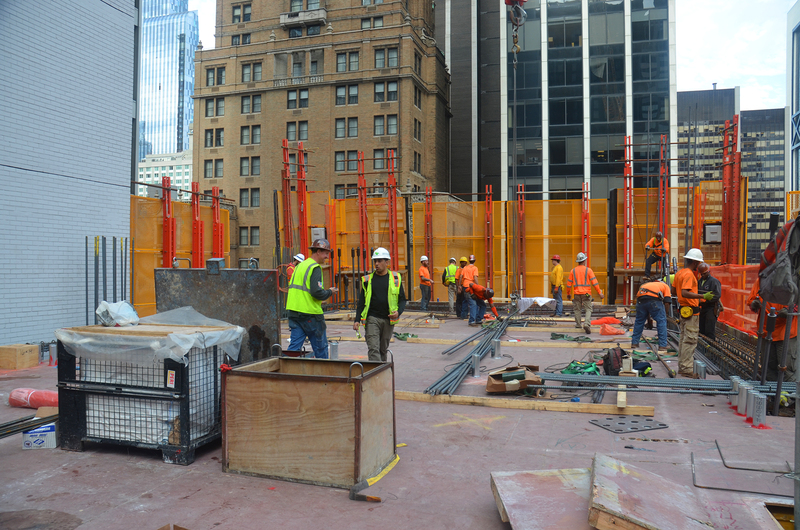 The Department of Buildings requires sidewalk sheds to protect people on the ground, but they said this kind of caging provides greater protection when buildings of this scale are under construction. 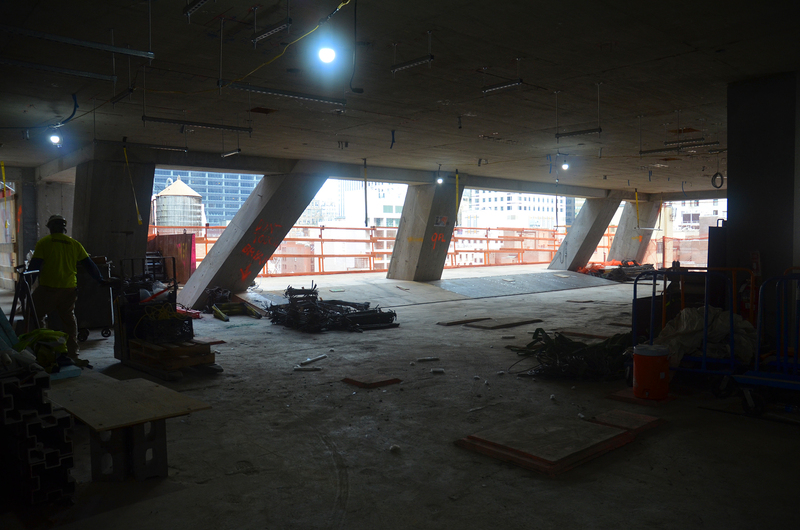 We also got a peek at the swimming pool on what is marketed as the 12th floor. 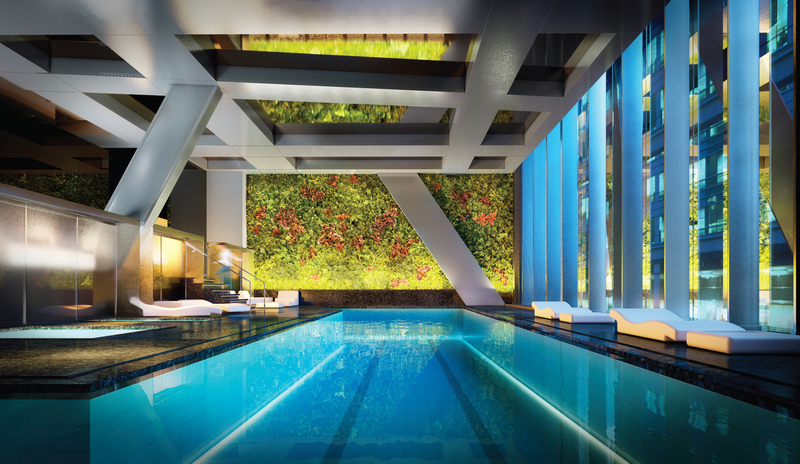 Many buildings, whether they be hotels or residential structures, often put their pools underground to allow more space for occupants above. 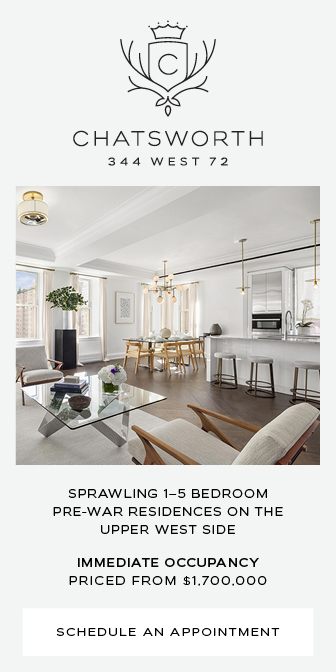 Situated across from Black Rock (the CBS Building at 51 West 52nd Street), the atmosphere will be a little different here. 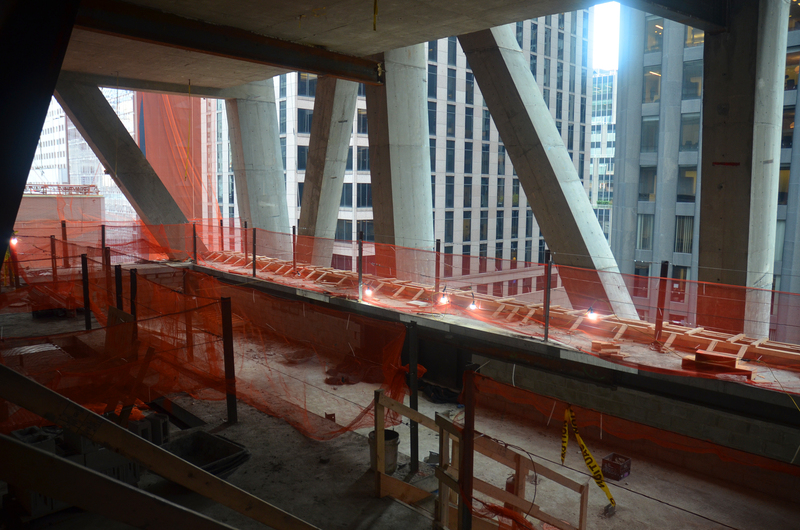 Construction is progressing at about a floor a week. Completion is expected in the fall of 2018. 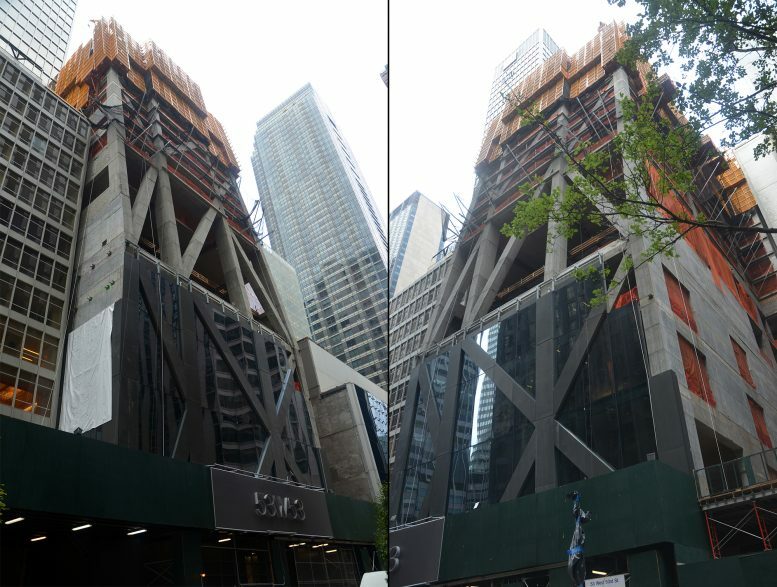 5 Comments on "Curtain Wall Installation Underway at 82-Story, 145-Unit, 1,050-Foot Supertall 53W53, Midtown"
The 82-story tower made in USA, and materials come from United States of America all the same.
? ?Don’t get it?? Who is the CM? GC? GM is General Motors Building, a famous 50 story white stoned slub on Fifth Ave, Black Rock, is nickname of 38 story Eero Saarinen Black granite sculpted tower on 6th Ave and 53rd. 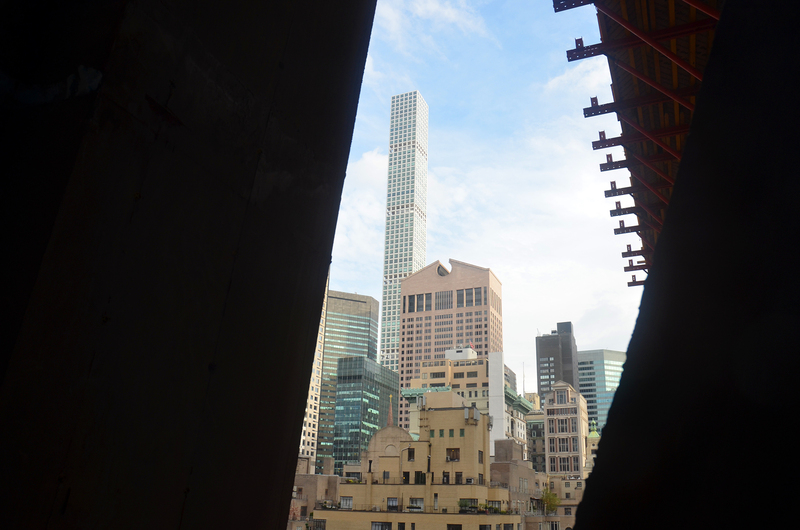 And developer name for this Jean Nouvel’s 82 story is a consortium of Hines and another 2 firms, see above in the beginning of this article. 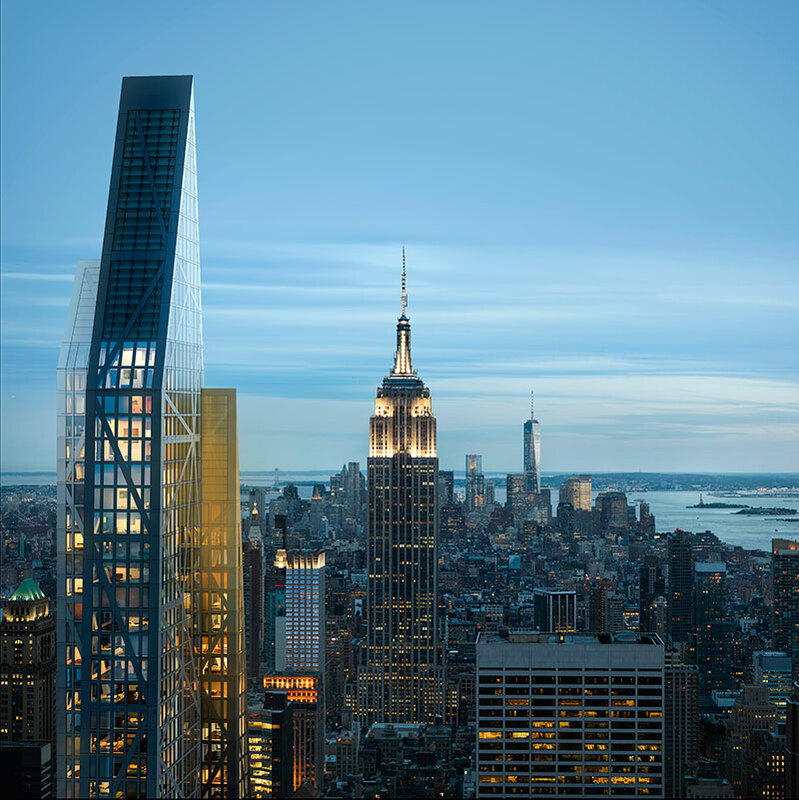 Also, former design before approved was 1250 feet, and still 82 story, but it was slashed, since being too tall, happened before even before supertall 432 park and One57 were built. 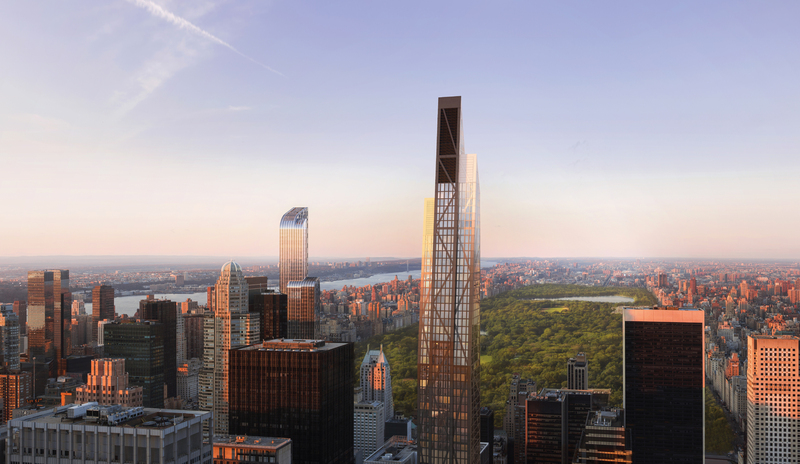 Now this a fifth/forth supertall in this area, if we count Stern’s 950 feet 65 story 200 Central Park West in the list of supertall(984 feet and up). Here, floor 12 is actually just above MoMa extension of 6 floors. So, it’s probably 76 constructed floors or even less. 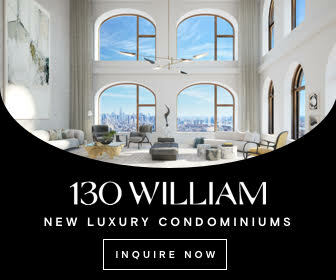 Like 432 park, marketing as 96 floors, while actually have 88 built, or 75 story One57, marketing as 90 floors, same happened with other tall buildings nearby, TWC, Random House, Trump Tower, even Downtown 30 Park Place, marketing as 82 story, while have 68 actually build floors, or WTC, 104 story, while count actually built floors as 78.